Sunny skies, running shoes and pink t-shirts were the order of the day last Sunday as 1,600+ Central New Yorkers ran or walked in the first annual “Run for Their Life,” a fun fundraiser organized by the Carol M. Baldwin Breast Cancer Research Fund of Central New York. Money raised by the Oct. 23rd event supports breast cancer research at Upstate Medical University. 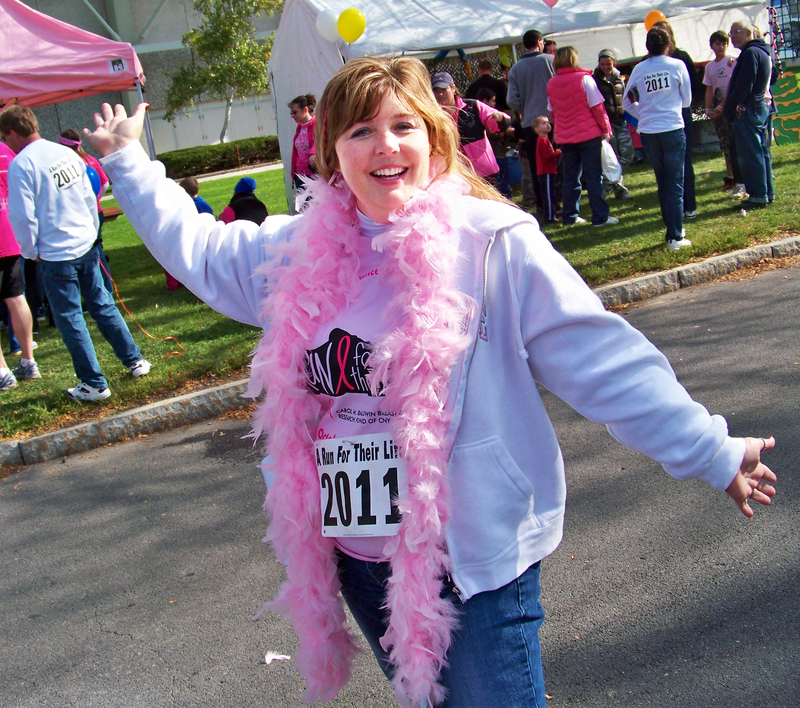 Many sported the fun accessories that the charity is known for: wrist bands announcing “save the boobies” or “fight like a girl” and pink t-shirts with “save the tah-tahs” emblazoned across the silhouette of a lace bra. Some wore custom outfits: hot-pink brassieres over t-shirts, a full-body stuffed pink ribbon, magenta boxer shorts and socks (worn in honor of a grandma, we hear). One runner had pink hair and at least one dog wore pink. It was a celebratory way to bring people together to raise awareness of — and money for — a serious medical issue. See the Channel 9 coverage. This entry was posted in cancer, community, health care, public health, research, women's health/gynecology and tagged academic medical center, breast cancer, cancer, cancer research, health care blog, health care social media, hospital blog, hospital social media, medical blog, SUNY, syracuse health care, syracuse hospital, university hospital, upstate medical. Bookmark the permalink. Want. Save the boobies. T-shirt. Where can I buy one?